A confession: I love a sad story. Not page-turning tragedy, or delicious melodrama mind – just plain old sadness that lingers long in my mind after I finish a novel. So, what is it about sadness that is so compelling? Could a sad story just be a tragedy without the drama? I rather like this explanation, especially when applied to one of my very favourite novels: Richard Yates’ The Easter Parade (1976). For me, the defining characteristic of this beautiful, heartbreaking book is the quiet sadness that permeates it, and it arises not from any particularly tragic events, but from the absence of such momentous occurrences. It’s a novel about what doesn’t happen to its protagonists, the serious-minded Emily Grimes and her older sister Sarah, as they grow up, age and ultimately wither under the weight of the years. “Neither of the Grimes sisters would have a happy life, and looking back it always seemed the trouble began with their parents’ divorce”: the opening words of The Easter Parade, laced with Yates’ trademark understatement. A happy life is not on the cards for our heroines, but is this the same as an really unhappy one? Yates certainly isn’t known for the diversity of his plots, returning to the quietly dissatisfied lives of the so-called ‘Silent Generation’ growing up in the 30s and 40s who discover that ‘convention’ – work, love, family – doesn’t make them as happy as promised. Yet The Easter Parade‘s particular power, I think, lies in its scope – almost an entire lifetime for these two sisters, whose paths diverge in early adulthood. We are, without fuss, diverted down Emily’s path, and follow her as she attempts to forge a writing career, marries and divorces, and watches her elder sister lead an opposite existence of anchored domesticity. And that’s it – for them and for us. The loss of innocence and the truths that only become clear in adulthood: these are well-worn themes, but never so heartbreakingly handled as this. Back to sadness and tragedy, then. Nothing particularly ‘tragic’ happens in The Easter Parade; two major characters do indeed die, both after prolonged periods of ill-health, but the understatement of Yates’ prose ensures their deaths seem more as logical conclusions to the lives they’ve led, however melancholy. It’s this emphasis on time and its passing that is key, and the overwhelming sense of sadness comes, I think, when ‘tragedy’ is spread thinly and almost imperceptibly over a lifetime. For Emily, time marches on at a quietly frightening pace – “Then suddenly it was 1955, and she was thirty years old”. The years mount up, and so do the disappointments: the unfulfilling sexual encounters, a failed marriage to an academic scarred by his own impotence, the autobiographical articles she just can’t finish, and – eventually – the corrosive loneliness. With Yates, it’s the little cruelties that leave their mark, in particular the way that personal relationships will inevitably, with time, curdle and sour – from the workplace mentor whose favour she eventually loses to the lover who remains obsessed with his beautiful ex-wife, to whom he will – of course – return. Indignities that could be healed in time – if only time wasn’t running out, at a pace that can’t help but induce low-level panic in the reader. Yet Yates’s deft handling of time’s passing never interferes with his acute observations of the here-and-now. In particular, his treatment of those fleeting emotional falsehoods we all indulge in during our interactions with others is enough to make you shudder in recognition. It’s in Sarah’s mannerism of hiding her mouth “after she’d told a joke and was waiting for the laughter, or when she was afraid she’d talked too much – with Cokes or popsicles as a child, with drinks and cigarettes” – or Emily realising how much she is enjoying “the high pleasure of the confrontation” with Sarah’s violent, bigoted husband, pausing to wish that her freshly-beaten sister “hadn’t washed her face […] it would have made a more dramatic picture the other way”. Read it and wince. For me, this exchange is one of the most quietly devastating in any work of fiction, and my heart hurts every time I read it. The pursuit of art and artistry – in particular, writing – is another crucial theme Yates returns to throughout his work, and it’s almost always in vain. So many of his characters drive themselves towards artistic self-expression in the hope of elevating themselves above the humdrum: Revolutionary Road‘s April Wheeler pushes her husband to fulfil his long-held ambitions of writing more than manuals and sets them both down a road towards despair; the Davenports in Young Hearts Crying exhaust and torment themselves in their quest to distinguish themselves with poetry and painting. In trying to produce a film of his life, the protagonist of Disturbing the Peace sends himself quite literally insane. We are repeatedly made to see how adults arrest their own development in its pursuit whilst claiming artistic immunity, yet in The Easter Parade even the attempts are arrested. Emily can’t finish the impassioned confessionals she keeps starting (“Abortion: A Woman’s View”, “On the Dole: A Woman’s Story”), and her poet lover Jack finds his voice once more only to be dogged by writer’s block, obsessive envy of a gifted colleague then, finally, cripplingly disdainful reviews. Sarah’s own thwarted ambitions to write are most affecting in their lack of pretension; her desire to produce an unfussy, factual life story of an ancestral pioneer is stifled by domestic servitude and the influence of her husband (the closest thing to the novel’s villain). Even Pookie the drunk tries to bestow grandeur upon her role in her unhappy marriage by likening herself to ‘the woman in A Doll’s House‘, but old age robs her of that character’s self-determination to make her own end. Let’s not forget, too, that her husband was a ‘copydesk man’ with failed ambitions of his own. So, art doesn’t bring any lasting comfort, and neither does family – or independence. Other people seem destined to either make you miserable, or just baffle you; as the truly surreal dinner party towards the very end of The Easter Parade, at which Emily might as well be a visitor from outer space, makes clear. But if the sudden fury felt by a fifty year-old Emily at the novel’s close doesn’t stem from a life ‘unlived’ – far from it – then what? Can there be such a thing as sheer bad luck, cruel fate – or is the terrifying truth that it might actually be possible to simply ‘fail’ at life? If I’ve made this all sound very dramatic, then I’ve done Yates a disservice, because it isn’t – that’s the point. Emily’s bitter fury at the world vanishes as quickly as it arose, and we leave her to continue what’s rest of her life. As endings – and novels – go, it’s the strangest and saddest one I know; and one of the very best. Read it. This entry was posted in Novels, Reviews and tagged Richard Yates, Teacup in the Bay, The Easter Parade. Bookmark the permalink. Very nice piece. I also love Yates. This captures him well. Well for someone who shockingly, and rather wrongly, hasnt read any of Yates novels I am going to have to remedy that quick sharp and the sooner the better frankly. 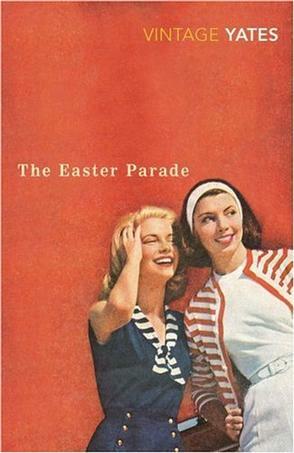 Would you say Easter Parade is a good place to start or a piece of Yates work that a reader should work up to? I haven’t got this one, annoyingly but always the way, I do have Revolutionary Road though. Fantastic post, really made me want to read Yates, thanks Carly, and TomCat for letting you guest post. Thank you for the kind words! I actually read Revolutionary Road first – as I think most people do, although whether they read any Yates beyond that is another matter – and would say that’s a pretty great place to begin (even more so if you already own it!). It really is staggeringly good. Carly, you nail this book! such a good review!! 🙂 But was confused when you say “Nothing particularly ‘tragic’ happens in The Easter Parade; two major characters do indeed die, both after prolonged periods of ill-health, but the understatement of Yates’ prose ensures their deaths seem more as logical conclusions to the lives they’ve led” do you mean that Yates trivialises death and treats it as unimportant by pushing it into the background or does he mean that a prolonged sad life is worse than death? Cheers Vonnie! And looking back on this you’re quite right, I don’t think I expressed myself properly here. I definitely wouldn’t say that Yates trivialises death – more that he’s keen to strip it of any notions of tragedy, or great import. The thing that really struck me about the two deaths in the novel is their total lack of dignity – for one character, it’s the end of a period of advanced dementia which is virtually longed-for by the other characters. Without wanting to give too much away, the other death is a vaguely suspicious one, and in any other novel, would be treated as a dramatic ‘whodunnit’ – but Yates is keen to stress that real life isn’t like a detective pot-boiler. (Actually, a lot of his most caustic character observations are rooted in people acting like they’re in a movie, or a play, or generally behaving in a way that rings embarrassingly false even to them). I think this sanguine viewpoint also has a lot to do with the psychology of his protagonist Emily, whose growing detachment from the world makes death seem like just another aspect of life that the living must endure. Wonderful review. I really the way you’ve focused on the quiet sadness that permeates this story – that’s probably the main reason why I love this novel so much. Great commentary on the little cruelties that leave their mark, too – I felt that was the case for Emily in particular. Also, as you say, Yates never moralises or passes judgement on Emily’s situation and lack of a ‘conventional’ family life – it’s quite telling that Sarah experiences sadness of a different kind in her own marriage. By the end, I found myself wishing the two sisters had been able to support one another a little more along the way…perhaps that might have helped to ease their pain.